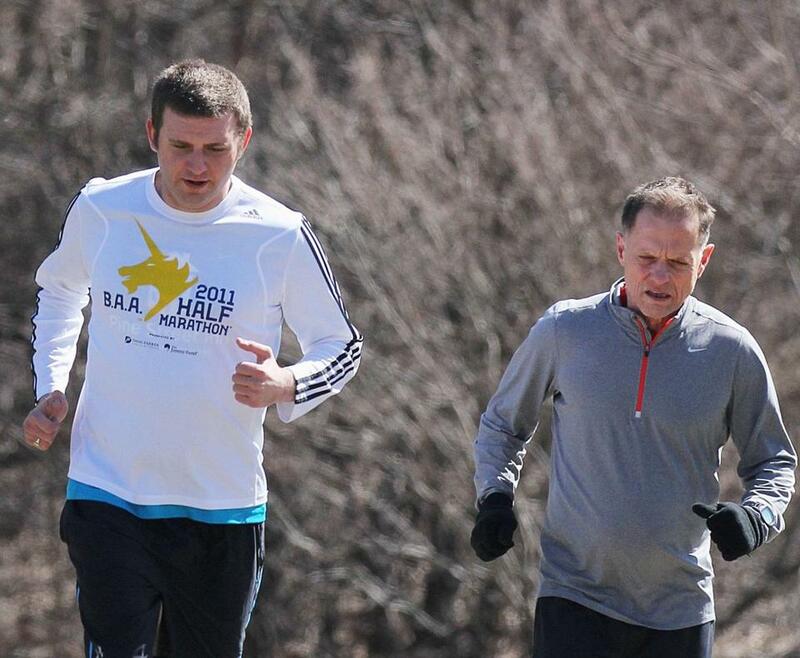 Stephen Stephenson (left) and coach Mike Ferullo trained in Franklin Park nine days before Stephenson’s first Marathon. Mike Ferullo is 64 and has run several marathons, including three in Boston. Saturday mornings, snow or shine, you’ll find him in Franklin Park, running with a group of young men. 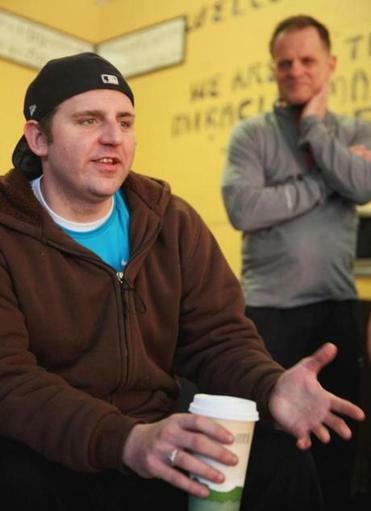 Monday, for the first time, a Bulldog club member ran the Boston Marathon. He’ll never forget it. Stephen Stephenson of ­Dedham ran, and Ferullo jumped in at Mile 23 to finish with him. At the Massachusetts Avenue Bridge, not far from the finish line, the runners were turned back. Ferullo agrees. “I had to stop three or four times to massage his calves because of spasms, and I swear to God, if we didn’t stop, we would have run right into it.” They were a quarter-mile, “or about four minutes” from the finish line when they were turned back. They were worried about Stephenson’s mother, nieces, and friends near the finish line, but learned they were OK. Neither man heard the explosions. The week before the race, the two men spoke enthusiastically of the Marathon. The step-by-step process of getting sober is sometimes compared to running a marathon. Stephenson is a recent graduate of Pine Street’s Stabilization program. An athletic kid from Dedham, he fell into drug and alcohol use in high school. Stephenson, who still lives on the Shattuck campus near the Stabilization unit, joined the team in July, and in October, he and Ferullo ran the ­Boston Athletic Association’s Half Marathon. Stephenson finished in 1 hour, 44 minutes. Those in the club — named for Ferullo’s English bulldogs Rocky and Gus — run on Tuesdays and Thursdays and train with Ferullo on Saturdays. But most of the men aren’t, and Ferullo starts them off on what he calls LSD: long, slow, distance running. Newcomers may start at 2 miles the first week, eventually getting to 5 or 6. When a runner achieves the 6-mile mark without stopping, he gets a T-shirt. Ten miles gets him a pair of running shoes. Ferullo urges the men to run on the treadmill in bad weather and encourages them to cross-train on days they don’t run. Marathon Sports donates slightly used running shoes, which Ferullo gives the new guys. For brand-new shoes, he holds fund-raisers. In fact, ­Stephenson’s Boston Marathon run was a fund-raiser to benefit the Bulldogs and the Stabilization program. He was given a charity number by John Hancock, which means he had to raise $5,000 for a nonprofit. He did, helped by Pine Street staffers who sent out an e-mail blast. Growing up in the North End and Revere, Ferullo became involved with drugs and dropped out of school. But he got the help he needed and went on to college and graduate school. He’s been married 25 years and has a 24-year-old son. Today, he’s a licensed social worker with a practice in Brookline specializing in helping men and boys with addictions, anxiety, and depression. An exercise program is invariably part of his prescription. Ferullo also works part time as a social worker for the Watertown public schools. Stephenson and Ferullo say they hope to qualify for a marathon in Lowell in October, and Ferullo will train Stephenson for next year’s in Boston. “I’m proud of him,” he said.